Yesterday morning while I was fulfilling my sacrosanct Sunday morning ritual of coffee & an old black & white movie, I browsed a few recipes looking for what to make for dinner. Sunday is often the only night I really have time to cook anything beyond packaged ravioli or a Kashi pizza, plus I can make extra for lunches. 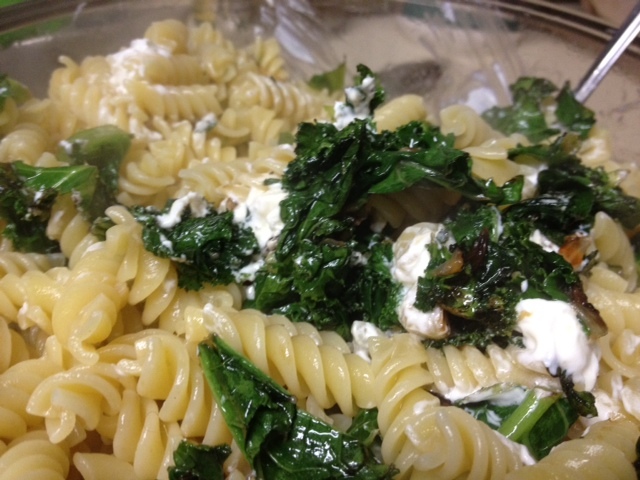 I’d found two Smitten Kitchen recipes from my stash of Pinterest pins that I liked (Garlicky Broccoli Rabe Pasta and Asparagus, Goat Cheese & Lemon Pasta), and figured I’d get to the store and call an audible based on what I found. Unfortunately, Publix didn’t have any broccoli rabe, and I wasn’t in the mood for anything super lemony (I’ve kind of exhausted that lately), so I decided to grab an element or two of each and just wing it. I always have kale on hand, and I had some random greens (komatsuna, arugula, maybe something else?) and a shallot (scallion? let me know wow, leeks…it was a time of innocence) from my weekly box o’ farm veggies that I needed to use up. And, MAN, did it hit the spot tonight?! 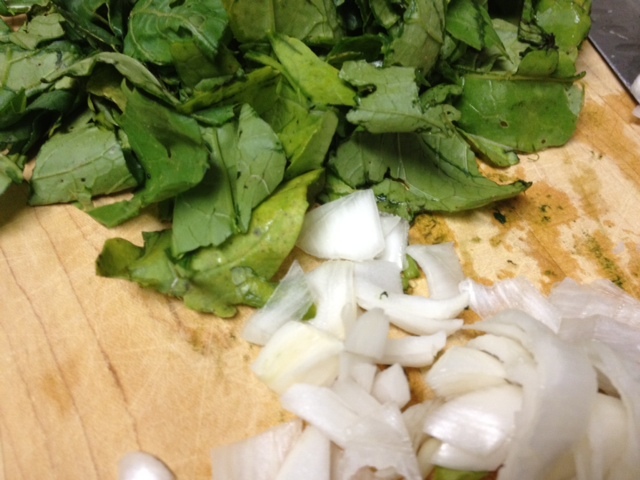 Roughly chop the greens and set them aside (not the kale, I prepared that separately). 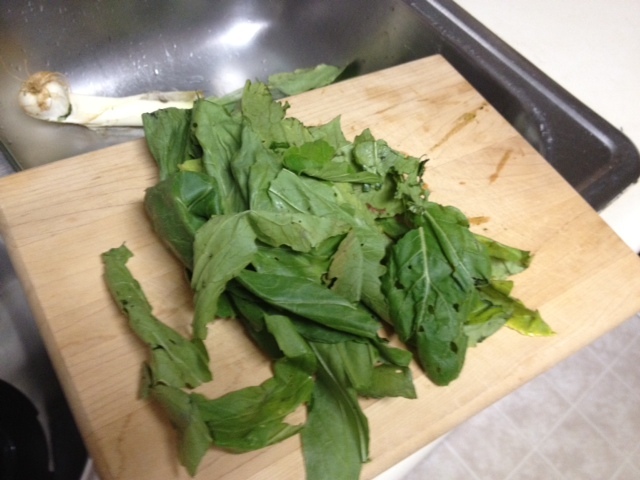 If you’re using kale that’s still on the stem, go ahead and take the stems out and tear or chop into large pieces. 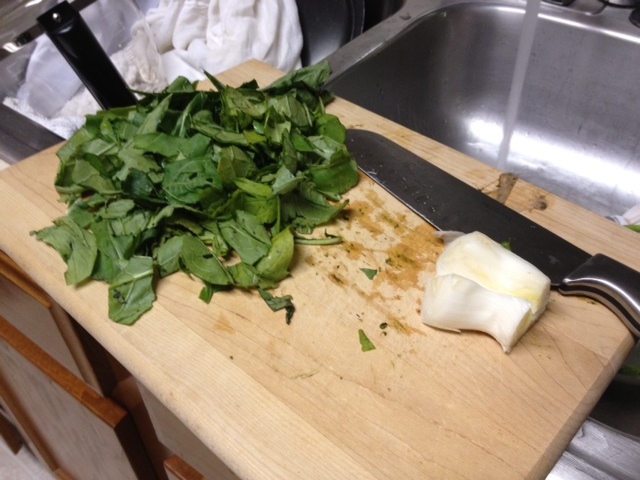 Chop up the shallot/scallion (for real what is wrong with me?) leeks if you have it. If not it’s no big deal but it does add a lovely sweetness that I hadn’t anticipated. 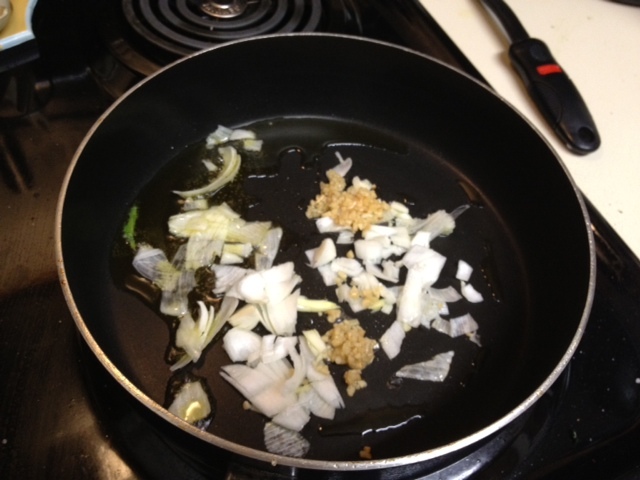 In a saute pan on medium to medium-high (around 6 on my stove), heat some olive oil and throw in the shallots/scallions and some minced garlic (yes, mine’s from a jar). Stir around for a couple minutes. 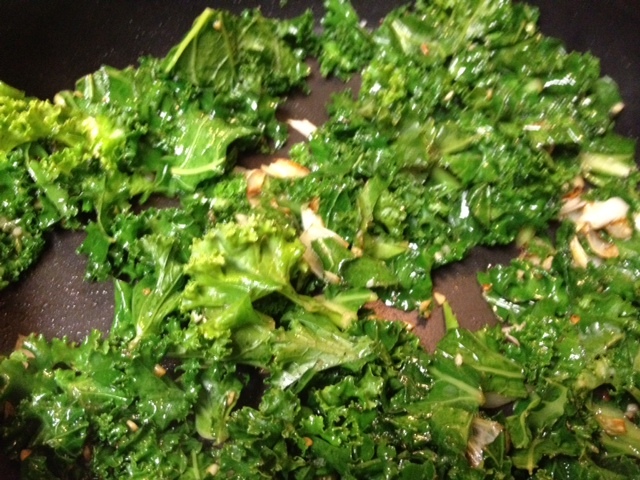 Throw the kale into the saute pan, add salt and pepper, and cook for several minutes. Your personal taste/texture will have to guide you, I like mine a little overdone and tending toward crispy (similar texture to if you roasted it). Set that aside. At the same time, set a pot of water to boil. Salt when it’s come to a boil and add the pasta. I used fusili, but anything would work (preferably something that will grab the other elements). 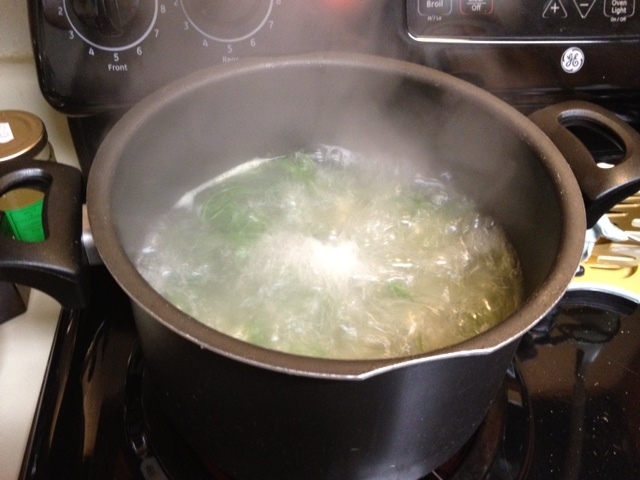 When the pasta’s a couple minutes from being done you can add the other greens into the water. Note, for these types of soft greens (arugula, etc.) this isn’t probably necessary, but if you were using something like a broccoli rabe, swiss chard, etc. it would probably help. 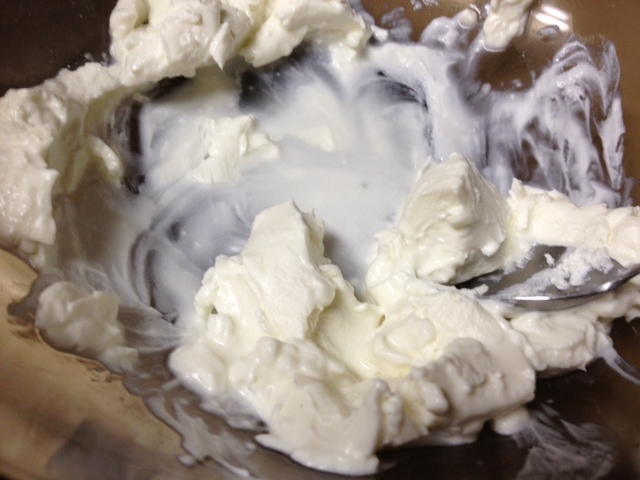 Put a small log of goat cheese in a big bowl; I had to soften mine up a little (10-15 seconds) in the microwave. Add little bit of pasta water too. 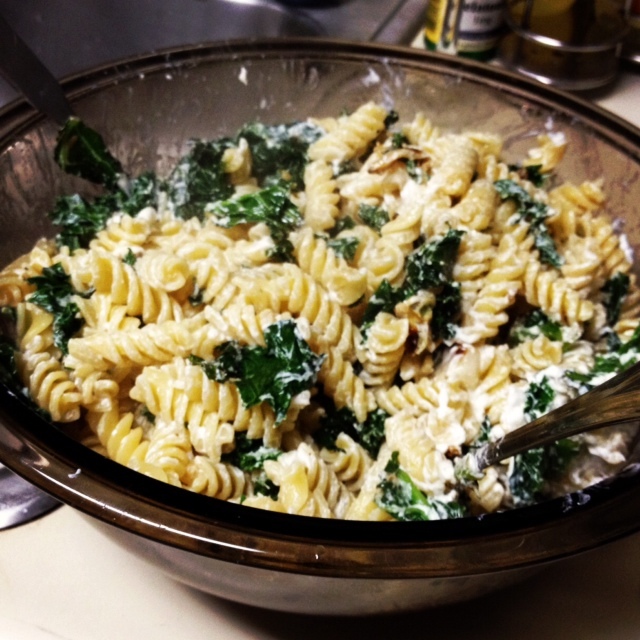 Add the pasta, boiled greens, and kale into the bowl when done. Toss everything together, and all done! Probably needs a little extra salt, mine did. The great thing is it’s super adaptable based on whatever’s in season—you could use asparagus if that’s your thing, just about any green leafy thing, broccoli or broccoli rabe, whatever. 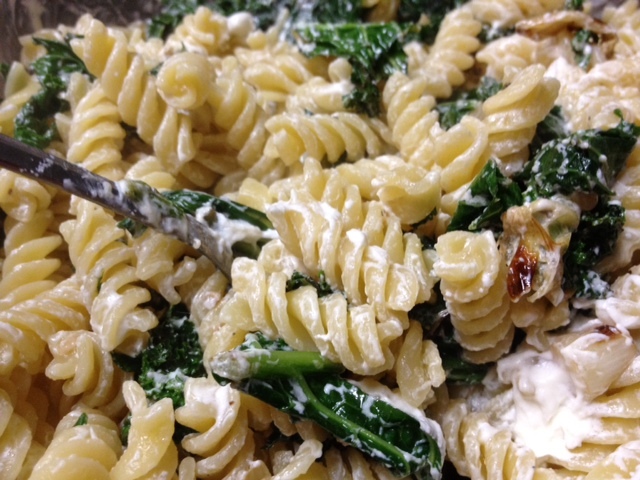 The goat cheese makes a really nice, salty-yet-creamy sauce with the pasta water. The komatsuna and arugula added a bite/tang that the kale itself wouldn’t have done. And you get your daily complement of veggies and vitamins. It also stores well, makes a great lunch. And yes, I made a side of sauteed kale to go with it and had a cold, sweet glass of white wine…why mess with tradition?